I’m a writing fellow at a state university, and that means I’m tied to an academic calendar. Summer always feels a bit off-pace in academia. We work, but the rhythm is different — fewer classes, more special projects. Every summer, I set goals for myself that I wouldn’t dare to set for the regular school year — things like the massive pile of sewing I completed in June and the storage unit clean-out I’m tackling this month. This rhythm works well for me because it allows me to process my yearly goals in chunks based on the semester. Summer is always a slow semester, and summer always means loads of progress on other fronts. It also means three months when I’m ripped from my normal routine and dealing with a lot of one-off tasks, and things like blogging tend to get pushed to one side. That has certainly happened this summer. I’ve had a hard time even remembering to blog, and that has been complicated by learning I need to have surgery next week. I had a couple weeks’ warning, so I’ve spent these past weeks trying to get everything set up for the recovery period. I’m not worried at all about the surgery, which is a simple procedure with an extraordinarily high success rate. But I’m a bit worried about the aftermath, when I might not be able to do most of the things I normally do. Like, you know, be awake. So even though we’re shifting into the fall semester now, I think it might be a couple of weeks before I’m back to my regular routine. I have mountains of half-finished projects in my sewing room right now. Really, mountains. I can’t see the top of my large sewing table or the two dressers I use as storage and work spaces. I’ve started putting things on chairs because I’ve run out of other surface area. It’s a symptom of the way things are going right now — I have a few minutes, just a few, at irregular intervals to try to cram in a bit of sewing. Knitting seems a little easier to get into right now because I can drop a project in the middle of a row if need be. Harder to drop a sewing project in the middle of the seam. One of the projects currently littering my table top in many pieces is this formerly finished dress. 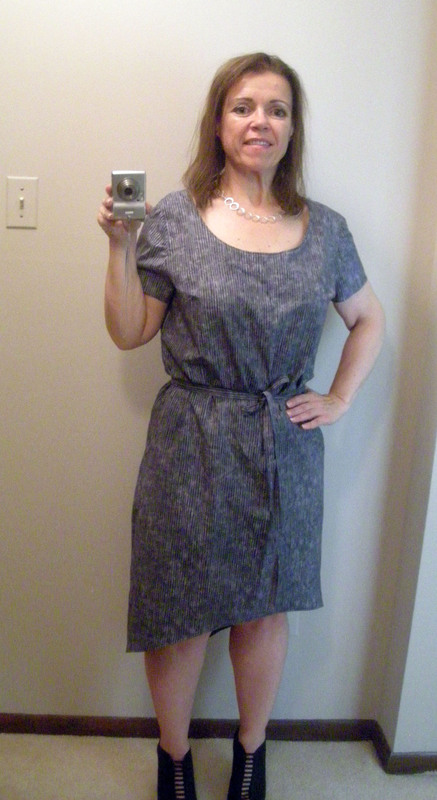 This is McCall’s 7120, a fairly new dress pattern that caught my eye because of the loose shape and asymmetrical hem. 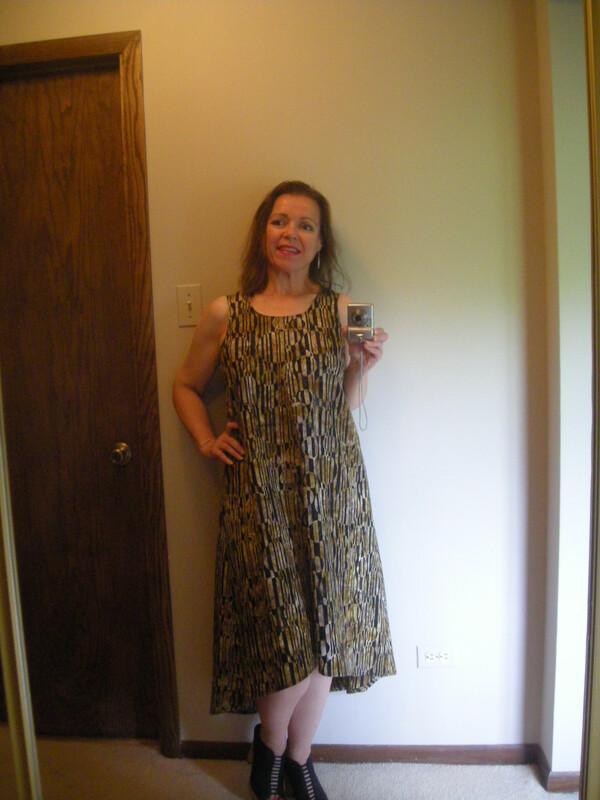 I thought it would make a cool, comfortable summer dress good for backyard parties, and in fact, its first wearing happened at my niece’s 8th-grade graduation barbecue. The fabric has been in stash for so long that I can’t even tell you where it came from. 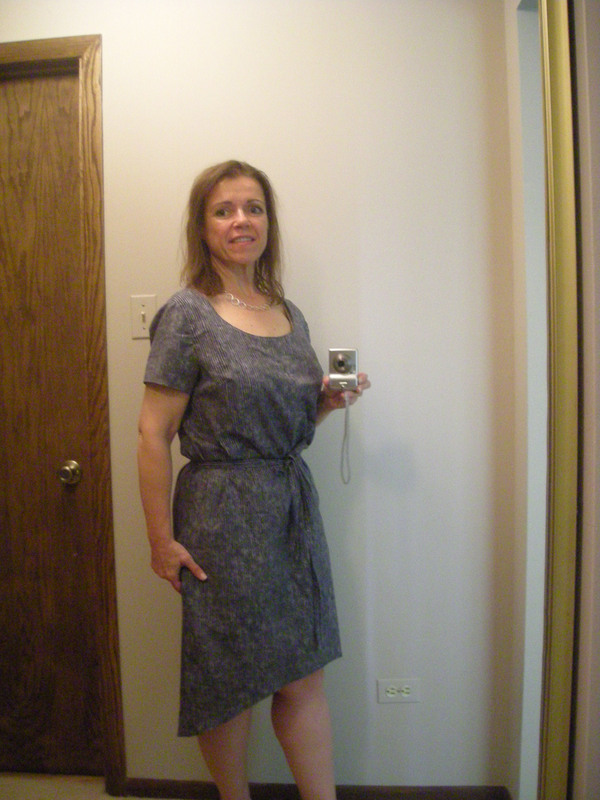 It’s in a very lightweight gray cotton, about as light in hand as a batiste but completely opaque. Perfect for a hot sunny afternoon, right? Yeah. The issue with this dress is a little more apparent in this photo. It’s really broad through the shoulders. REALLY broad. 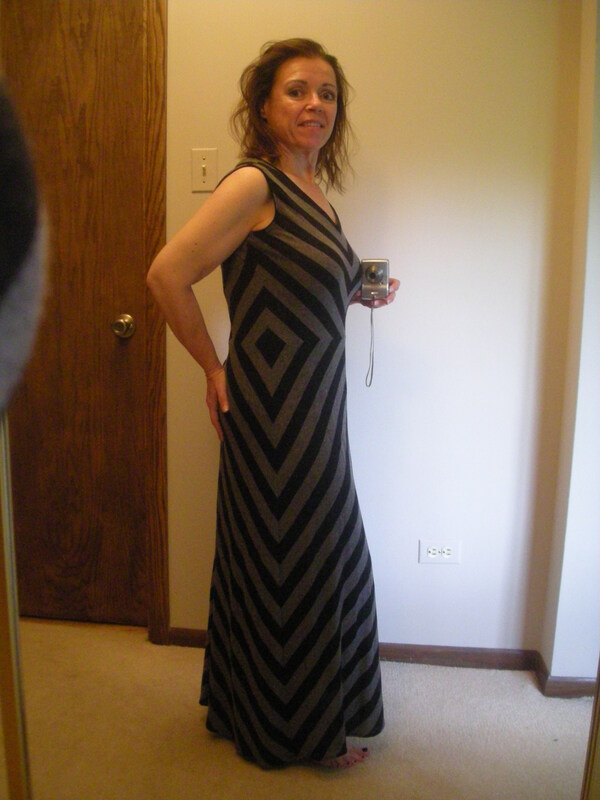 I used a smaller size above the bust line (McCall’s patterns tend to run wide in that area), and it’s still so broad there that it can slide off my shoulders when I move. You can see, along the armscye in the arm holding the camera, how the extra fabric sort of pools and bags there. So, despite having worn it a few times already, I decided to rip the darned thing apart and narrow the shoulders so I don’t have to keep tugging at it when I wear it. 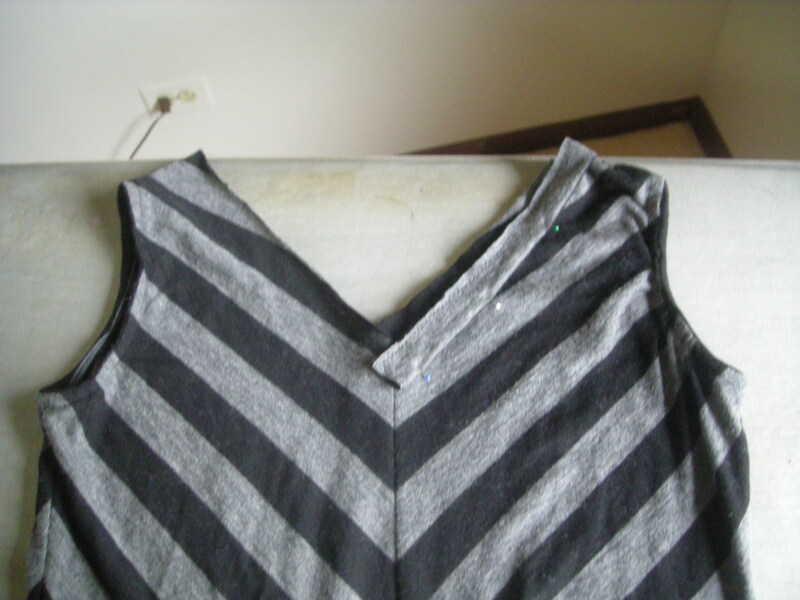 I’m taking it in along the center back and center front above the bust line (using darts), and I might try shaving a tiny bit off the shoulder seams, too. 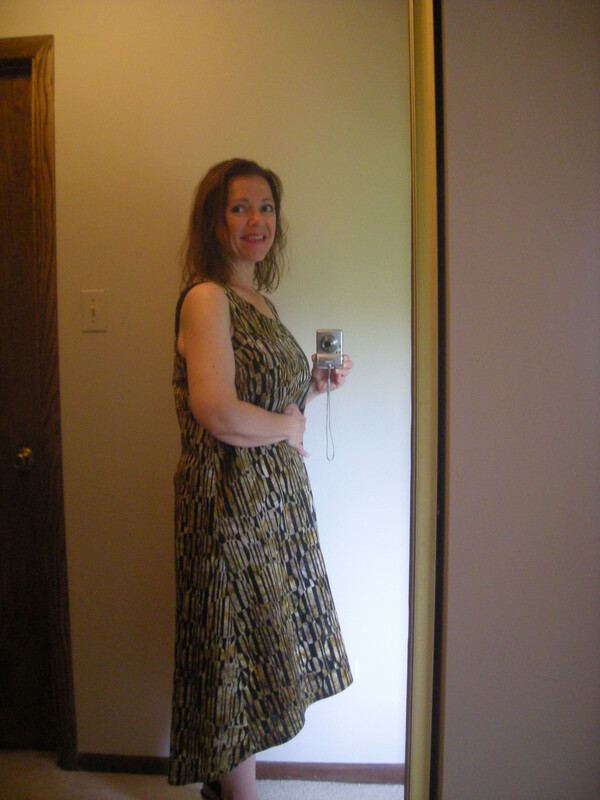 This will result in a higher, narrower neckline, but I’ve decided I’m okay with that. 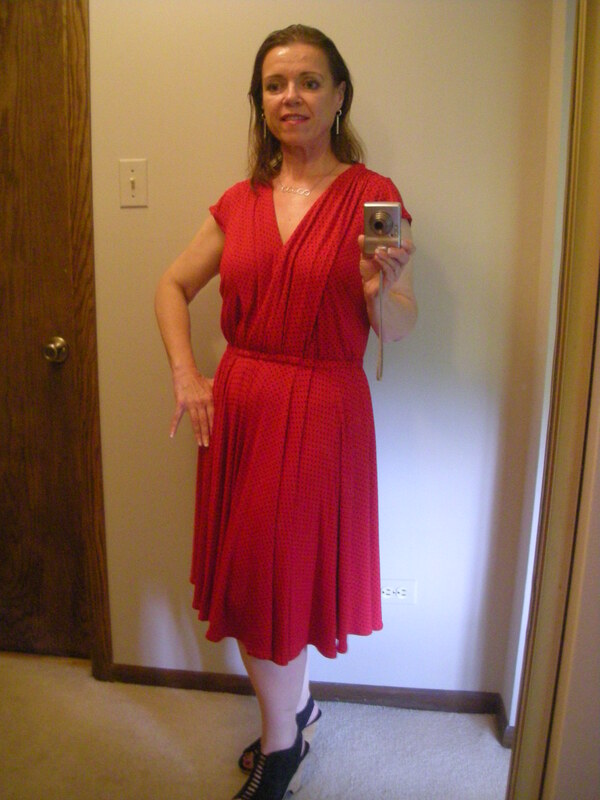 If I make this dress again — and I might, just because this is one of those versatile patterns with a clean shape and good hem and sleeve variations — I will redraft the shoulders to preserve the original neckline while achieving a better fit overall. 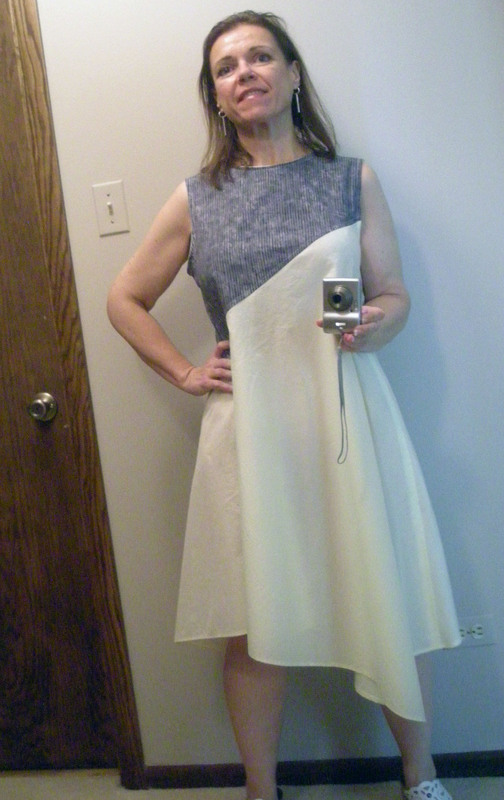 This was one of the stash sewing contest entries from June that I just haven’t had a chance to blog yet. I’m going to try to load my queue with a couple others before I go in for surgery, but please forgive me if I can’t respond to comments as quickly as normal. I don’t know how the recovery from surgery will go — I might find myself on the computer a lot, or never at all. We’ll see! 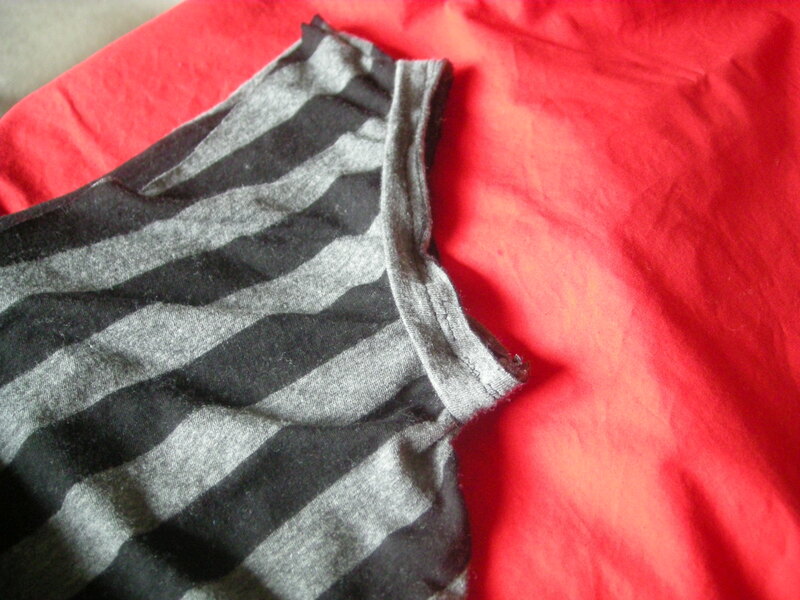 Do you ever rip apart a finished garment after a few wearings to tinker with the fit? 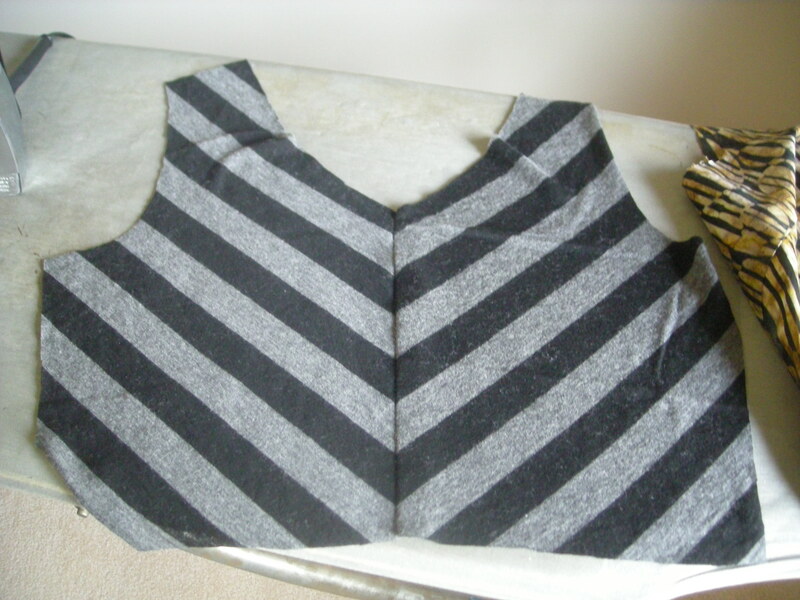 I’ve blogged about this dress before, about the process of cutting and seaming it to get the stripes to align properly. I thought I would also show you the two methods I used to finish the raw edges at neck and armscye. 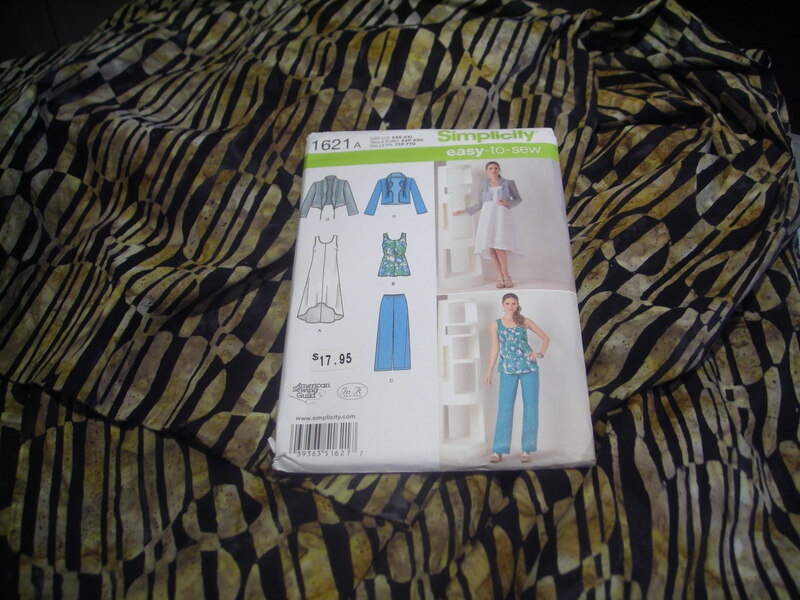 This fabric is a very light jersey, very fluid and drapey, perfect for a floaty kind of garment. The skirt on this dress moves beautifully. With this kind of very light jersey, though, I always want to make sure that the seams above the bust line — shoulders, armscyes, neck bands — are stable and clean. For the armscyes, I chose an invisible banding finish that I learned years ago from a commercial pattern. First, you cut a strip of fabric on the grain to use as a binding. The strip should be about two inches wide, and the length depends on the size of the armscye. Measure the armscye opening and deduct 20%. 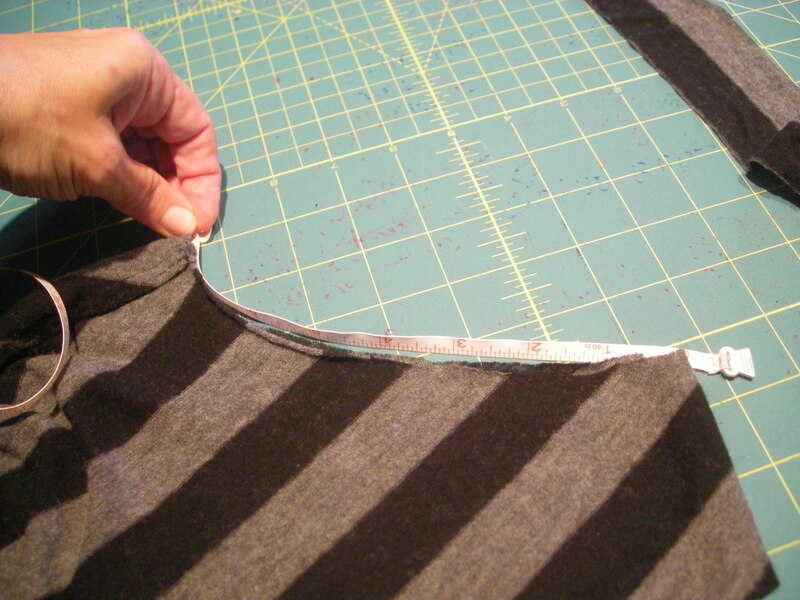 Then you add a bit for seam allowances — I do half-inch seams here just because it makes the math easier. But you want this strip to be about 20% shorter than the actual armscye. 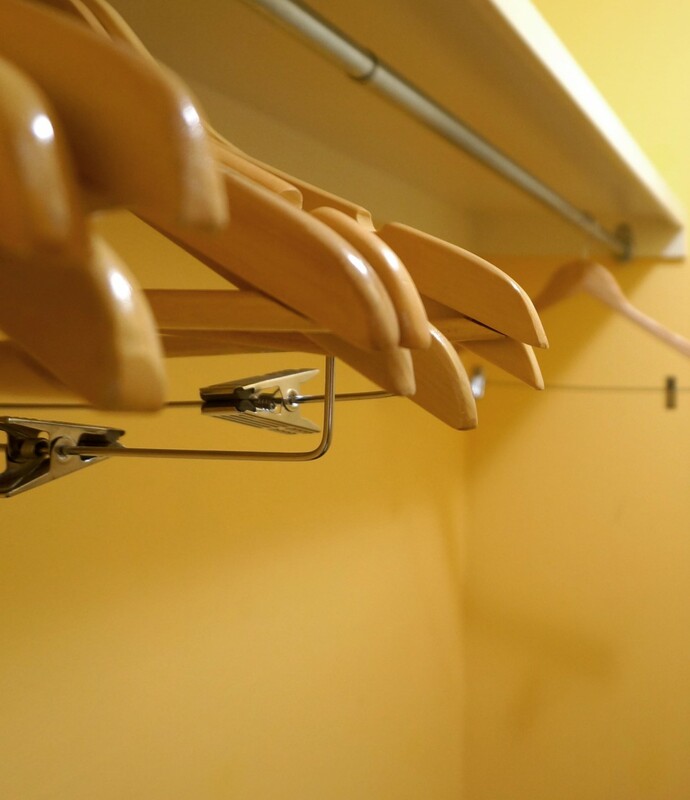 You’ll stretch it to fit the opening, and the stretch will help it curl to the wrong side and lay nice and flat. 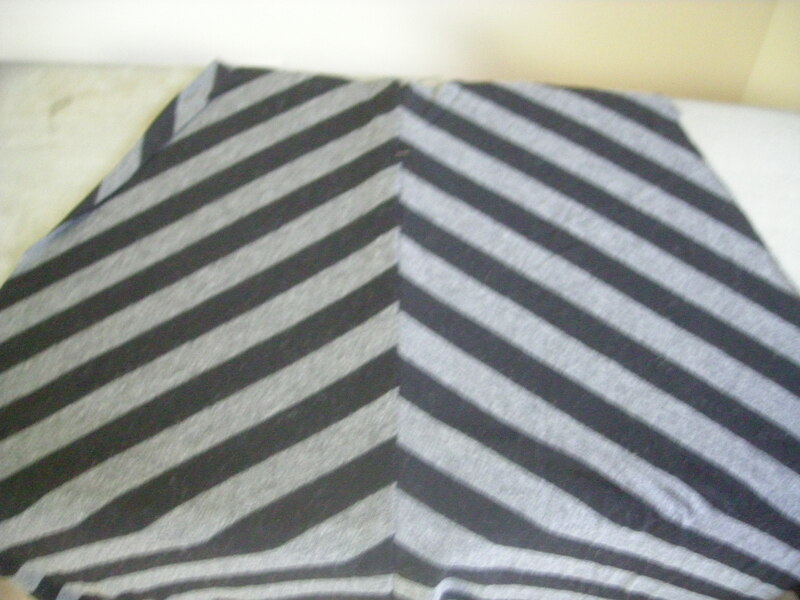 Each stripe is about an inch wide, so that’s a 2″ strip. Measuring a curved edge is easiest when you stand the tape measure on its side. 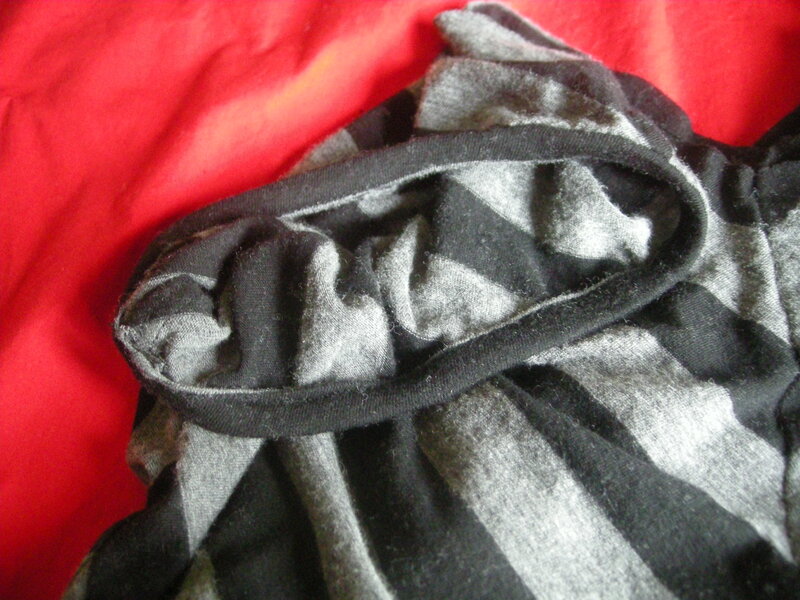 Because the armscye is a round opening, I make a loop by sewing the short sides together, then folding the piece in half lengthwise, wrong sides together, and stitching the raw edges together with a stretchy stitch (in this case, a plain zigzag). Using a stretch stitch makes it easier to stretch the piece to fit the armscye, but sewing the edges together makes the piece more stable when you’re attaching it. 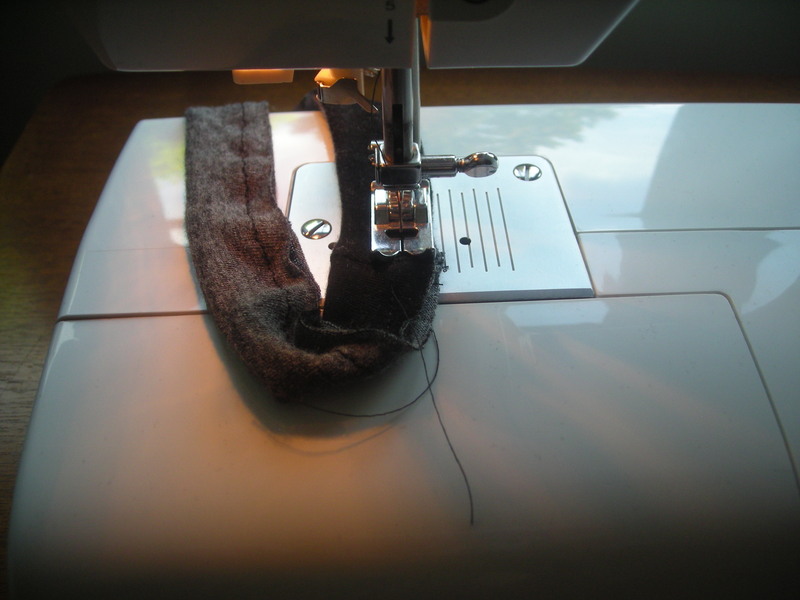 Then you quarter the loop as you would an elastic loop and pin it to the armscye on the right side. Loop pinned to the right side of the armscye, raw edges together, using the quarter marks for placement. Then you stitch this in place using either a 1/4″ or 3/8″ narrow stretch seam (dealer’s choice), and without trimming anything, turn the whole band to the inside and stitch it down to the armscye. This means you’re stitching through five layers of fabric — the garment, plus four layers of the band. When I stitch this second turned seam, I make sure to stitch an eighth or a quarter inch wider than the first stitching line. So, if I used a 1/4″ seam to attach the band to the right side, I use a 3/8″ or 1/2″ seam when I flip it around to the wrong side. This ensures that the raw seam line is encased in all those layers of fabric. And that’s really it. The result is a clean edge with a stable finish that won’t be distorted by the weight of the dress. The view from the public side. 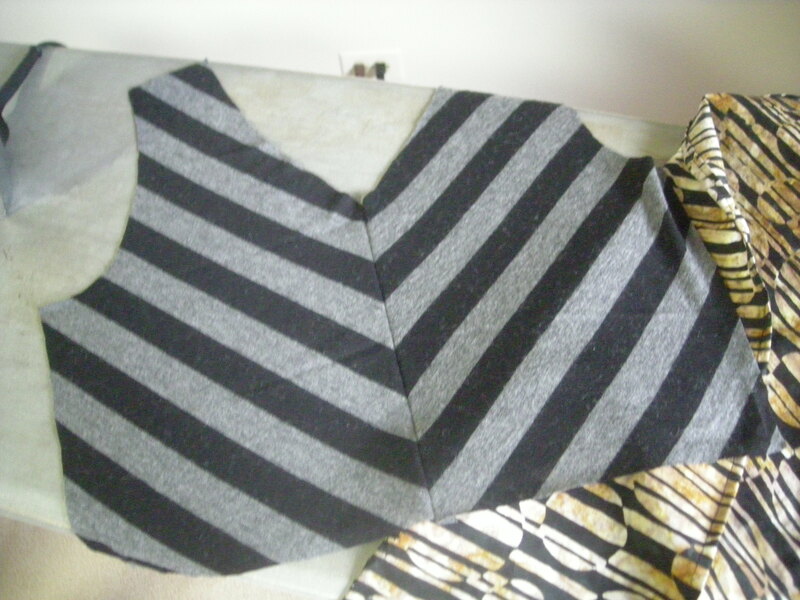 For the neck band, I chose an exposed lapped V-neck band. This band starts in exactly the same way, by cutting a strip two inches wide and 20% shorter than the length of the raw garment edge. 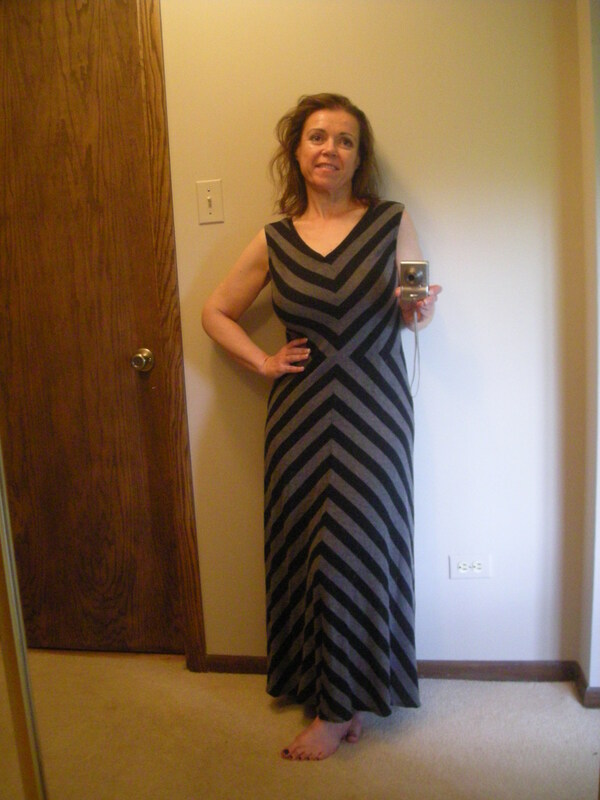 Because this dress has a vee on both the front and back, I cut two strips, one for each side, because I would lap them in both the front and back. 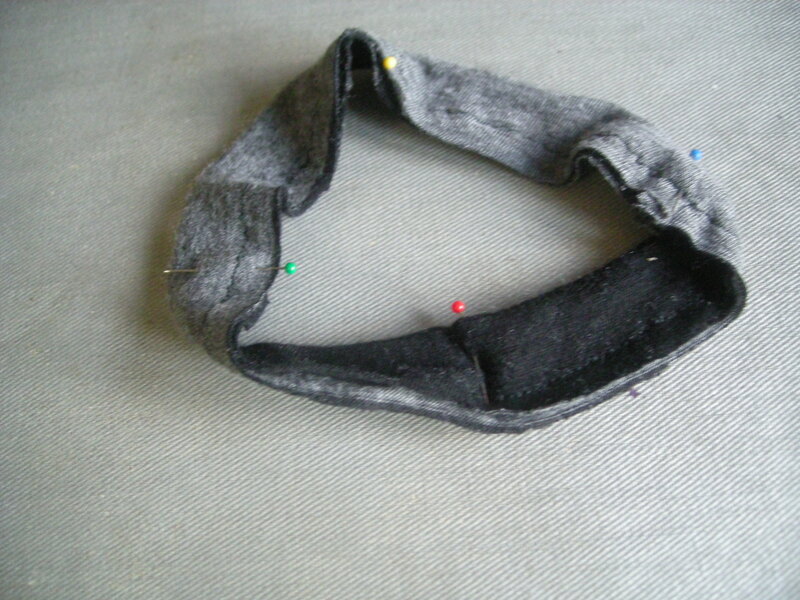 Instead of sewing them into a loop, I just folded and stitched the long raw edge, then pinned it to the right side of the neckband. Applying the first neck edge band. And then the second band. 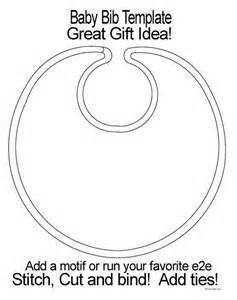 I never stitch all the way to the vee point, but leave about a half inch free where it laps. This is because you can make yourself crazy trying to hit that V in exactly the right spot, in exactly the right way. Or at least, I can. Maybe others more gifted dressmakers out there don’t struggle with this the way I do, but I’ve basically given up trying to hit that mark. I found a cheat that works a bit better for me. In which I display what a cheater I am. Then I turn the band so that it lies flat with just a bit of the folded edge poking up from the neck edge. And I pin very carefully to make sure those edges are lapped properly on the wrong side. Some sewists advocate stitching in the ditch at this point, but I prefer to stitch just next to the ditch on the garment piece to catch that band and hold it in place. I aim for a scant 1/8″ or maybe 1/16″ from the ditch, and I use a narrow stretch stitch, the narrowest setting on my machine. 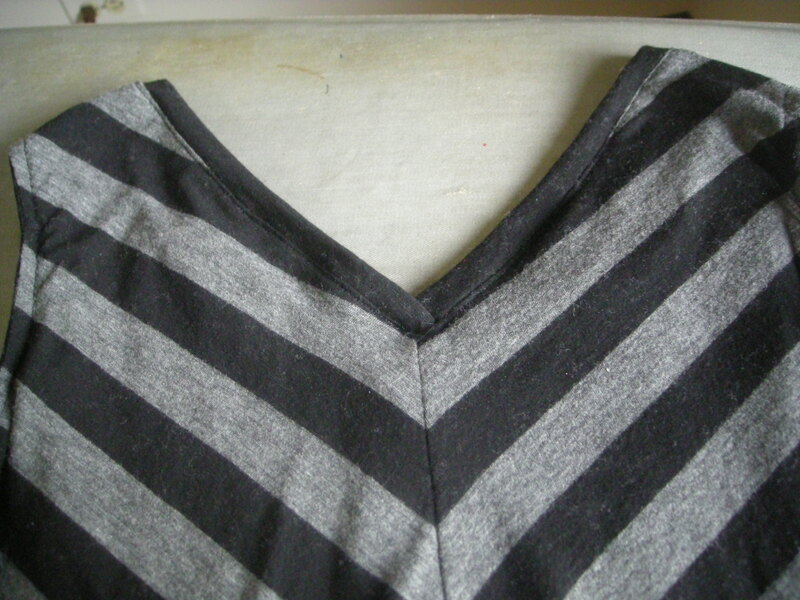 As I approach the point of the V, I shorten the stitch length so that there are more stitches at the point. This adds strength to the seam at that point, and it eliminates the need to back stitch at the V.
The finished band, not yet pressed. So there you have it. 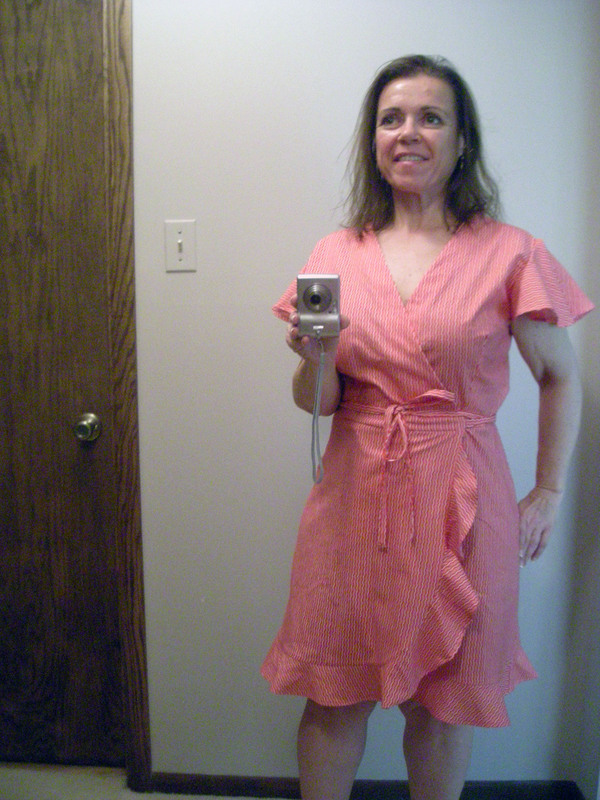 Here’s the finished dress, McCall’s 7121 View B, with lightweight striped cotton jersey from Fishman’s Fabrics. 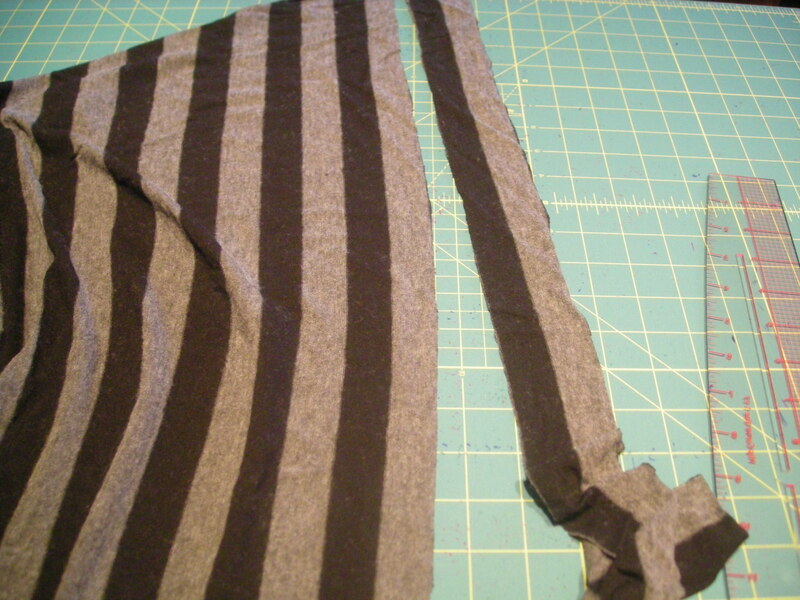 Blissing out over the perfect stripe matching. Worth the work! I’m crazy about the side view with those stripes. So that’s it. Another summer maxi, weightless and cool, that will be just perfect for knocking around town on a hot day. This one took a bit of time and fussing, but I’m really happy with how it turned out and can’t wait for the chance to wear it. 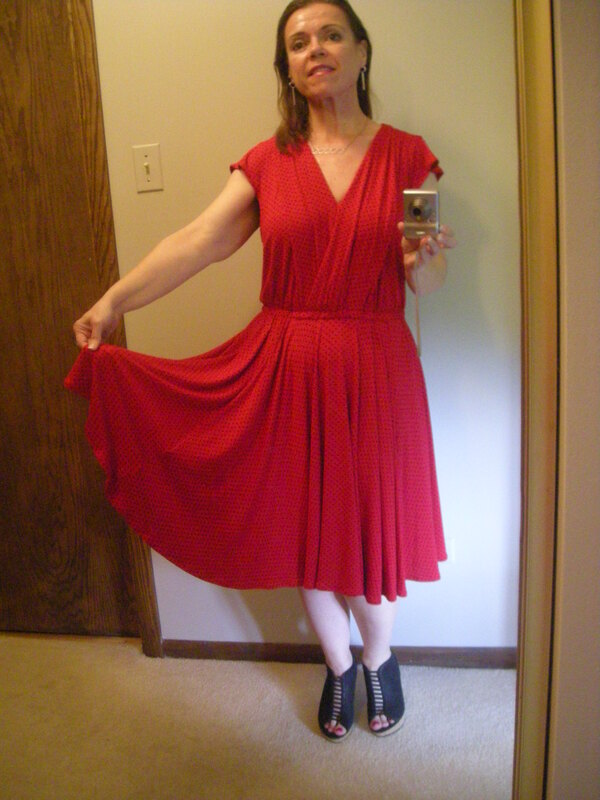 I’m thinking with either silver or red flat sandals and a bracelet, this one is good to go. With stripes this bold, I wouldn’t want to add a lot of detail in the accessories. I’ve just barely started the sewing on the projects I cut out last weekend, but because I blogged about my cutting trick to match patterns, I thought I would show you guys the results. 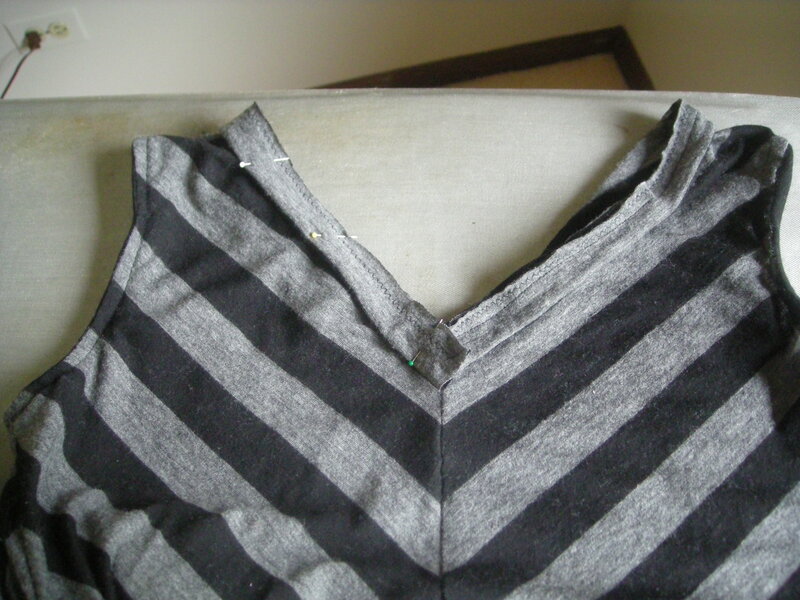 This is the bodice center front seam. Look at the perfection of that matching. Nailed it on the first attempt. And here’s the center back seam, also shockingly perfect. 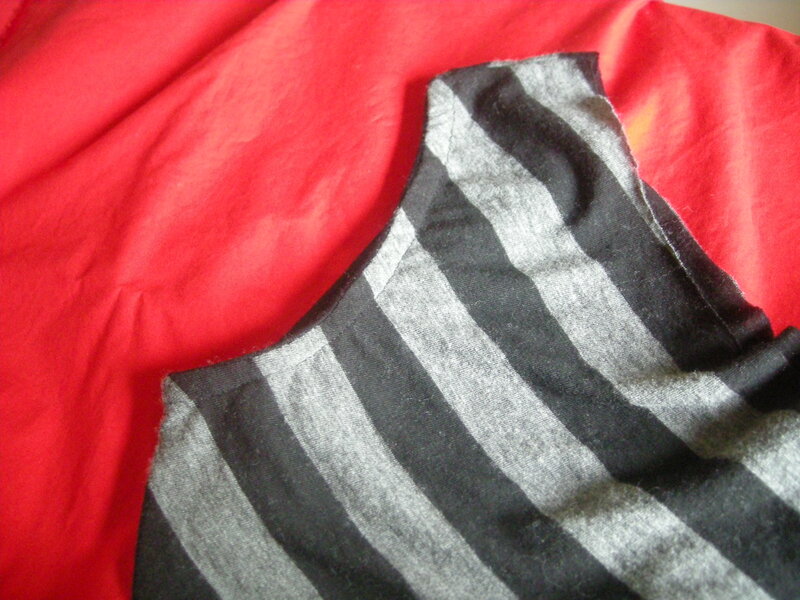 The center back seam of the skirt was a little less successful. I must have pulled it or something while sewing it, because it is nicely aligned for the bottom 2/3 of the skirt but then went a little askew on the top third. Even so, it’s not too bad, but I’m still going to rip it and restitch it along that misaligned bit. The good parts don’t show in the picture because I was using my ironing board as a layout surface, and the rest of the skirt is falling off the end of the board. In any case, this isn’t earthshaking stuff, but I love it when things work out, and the bodice pieces are definitely working out. Whew! 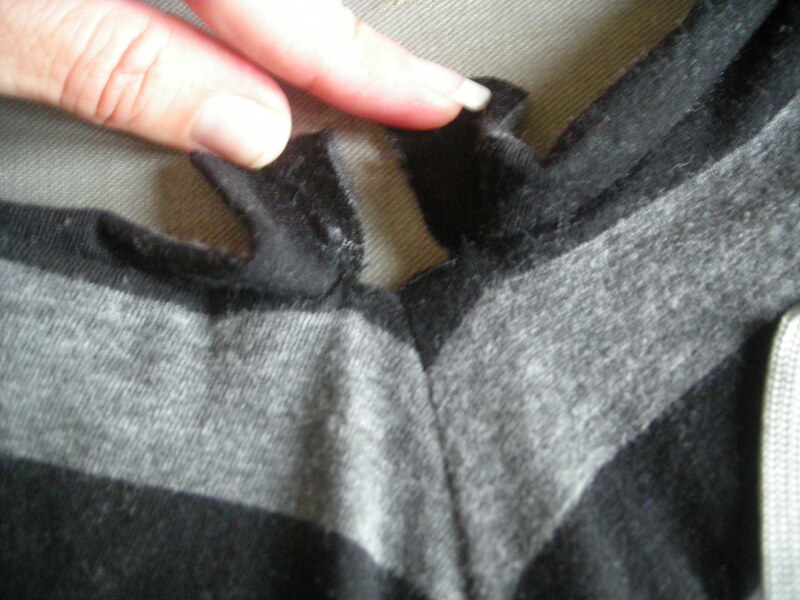 I’ll just have to be more careful with the maxi-skirt pieces — the weight of the fabric might be what distorted that seam.